This recipe calls for a bit more preparation than my other simple recipe for ice cream. The ingredients are about the same, but the process is a bit more intricate. I have made this with both a food processor and a blender, and the food processor is much better. You can still make it even if you don’t have a food processor, it just takes patience! Line an 8 1/2 x 4 1/2- in. loaf pan with 2 pieces of parchment paper, leaving a 3-in. overhang on all 4 sides. Using an electric mixer, beat the condensed milk, cream cheese and vanilla in a large bowl until combined. Add the heavy cream and beat until thick, stiff peaks form, 3 to 5 minutes. Meanwhile, using a food processor or blender, puree half of the strawberries. Spoon half of the vanilla cream mixture into the prepared pan, spreading it evenly. Tap the pan to get rid of any air bubbles. Fold 1/3 of the strawberry puree into the remaining cream mixture until combined. Spoon remaining strawberry puree over the pink cream mixture and fold in, leaving streaks of the puree to create swirled cream. Spoon over the vanilla cream in pan. Gently tap the pan to distribute the mixture and get rid of any air bubbles ( spreading will destroy the swirls). Cover and freeze for at least 8 hours and will keep for 2 weeks. 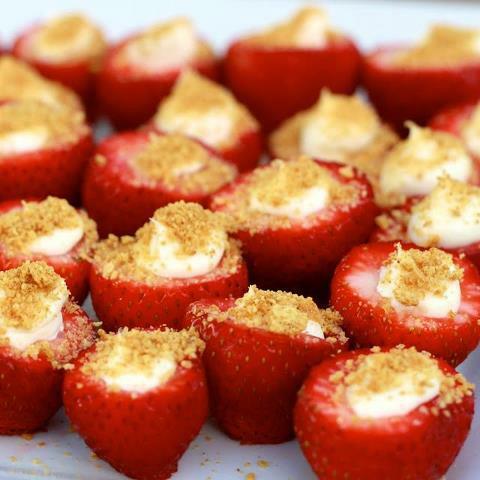 Thirty minutes before serving, cut the remaining strawberries into pieces and toss with the sugar. Let sit, tossing occasionally, for 25 minutes. When ready to serve, invert the cake onto a platter and remove the pan and parchment paper. Spoon the berries (and any juices) over the top.